marketing that drives many companies today." "Beyond compare... an absorbing book that really gets to grips with the challenges brands face today. Although written by different authors, the chapters sit coherently with one another, and the reader benefits from the different yet not divergent views expressed. Altogether the contributors deliver a powerful argument for brands to transform themselves and the world in which we live." 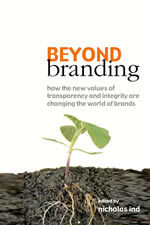 Beyond Branding, published in autumn 2003 and available in paperback from 2005, challenges business to adapt to a world of transparency by adopting new ways of meeting the needs of stakeholders and by operating with openness and integrity. It is the view of the writers of this book that when businesses account for 51 of the largest 100 economic entities in the world, not only should branding have a wider social perspective, it must do so if it is to have continued relevance. Business has to have a human perspective so that it benefits people rather than manipulates. It has to be transparent and open if it is to overcome suspicions of duplicity. We argue for a long term, people-centric view that stresses substance over hype. This will help to restore credibility and trust for brands. It will re-affirm the mutual commitment of the employee/employer relationship. It will give power to the consumer. And it will stress the pre-eminence of the genuine shareholder over the speculator. These are the sort of attributes we would expect of a nation state and increasingly we expect them of corporations. Business cannot assume a position of dominance without a concomitant assumption of responsibility. By ignoring these factors, we will face more protests from people who feel the threat of overweening corporate power. By accepting them business can have a beneficial influence and help solve (perhaps better than government) some of the most challenging problems in the world, while still being profitable. To get there, companies will have to incorporate into their brands a broader definition of their audiences and will have to adopt values that promote a human focus, authenticity, transparency and integrity. And they will also have to adopt measuring systems that focus on benefiting not just financial audiences. Beyond Branding, published by Kogan Page, sets out our views in more detail and presents alternative models for business to go beyond the limits of conventional branding.Ordering information. You can download a free copy of Chapter 1 - A Brand of Enlightenment as a pdf file. To soak up the carbon dioxide emissions in the production of this book and to help protect our climate, the writers of Beyond Branding have planted native trees with Future Forests. Future Forests is a UK-based company with a global vision: to protect the earth's climate.